Last Sunday was the feast of the Holy Trinity – usually called Trinity Sunday. As those who preach regularly will know it’s not exactly a favourite Sunday for preaching! Here is my sermon. How many persons in the Trinity? Before you answer that, let me tell you a story. It’s not my own story, it’s a story from Donagh O’Shea, a member of the Irish Dominicans. There is only one Sunday in the whole of the Church Year that is dedicated to a doctrine, and that is Trinity Sunday. And that’s probably a good thing – because if there’s a way to make sure that people don’t listen to your sermon it’s to preach on a doctrine. But today I have little choice, so here goes! I began with a question, and I’m sure that even if, like Gianni in the story, you didn’t know the answer you’ve worked out by now that the answer to the question I began with is three. And yet … we believe in one God. That’s how the creed begins. Today is Trinity Sunday and our readings remind us of the nature of the Three-in-One God – Father, Son and Holy Spirit – who created and is at work in our world and in us In our Old Testament reading from the book of Isaiah we hear the writer telling us of the greatness of God. He reminds us that God is the creator of the whole earth. And yet a God who reaches down and supports those who wait upon him. Sometimes, perhaps, it seems impossible to truly grasp what God is really like – he is just too big for our finite minds to get around: …his understanding is unsearchable says the writer, and yet he cares for us. Our gospel reading this morning comes right from the very end of Matthew’s gospel. And it states in quite unequivocal terms a developing doctrine of the Trinity. Sometimes theologians say that the doctrine of the Trinity isn’t explicit in the New Testament. But this is one of those places where you can’t actually miss it. The eleven have their last meeting with Jesus in Matthew’s gospel. And he says to them: Go therefore and make disciples of all nations, baptizing them in the name of the Father and of the Son and of the Holy Spirit … We immediately recognise that as a Trinitarian formula, used by the Church since its earliest days. We begin our service with those words: In the name of the Father and of the Son and of the Holy Spirit. But try and think yourself back into the minds of the eleven when they heard Jesus say this. And the minds of those who first heard Matthew’s gospel read to them. The eleven were all Jewish, Matthew wrote his gospel for a Jewish community. They would have had an immediate understanding of what Jesus meant by the Father and by the Holy Spirit. The Father was God – Jesus had taught them to call God their Father when they prayed. And in Jewish. understanding of the Scriptures whenever the Spirit of God was mentioned they knew that was a particular manifestation of God. The Spirit of God had moved over the waters in creation – the second verse of Genesis tells us that – yet they knew that the Spirit of God wasn’t different from God, but was God himself, but God acting in a particular way. And then Jesus goes and puts himself in the middle – right between the Father and the Holy Spirit. And you can’t give a clearer message than that – Jesus is saying very clearly that like the Father and like the Holy Spirit he is God and a part of the Godhead. One God, but manifested in different ways. And as time passed after the resurrection the disciples slowly began to understand that Jesus and the Holy Spirit and the Father were but different facets of the One God who created everything.- Father, Son and Holy Spirit, yet still distinct, each from the other, in some way. And we see that growing understanding in the threefold blessing that Saint Paul gives at the end of the 2nd letter to the Corinthians, our New Testament reading for today. The special prayer that we call The Grace. Today we try to grasp that there are three persons in the Trinity – and yet one God. Perhaps that’s too abstract a concept for mere mortals to get their minds round. We experience the God who created us, the God who redeemed us, and the God who lives in us day by day. And yet trying to explain the doctrine of the Trinity, the God who is one God, and yet three distinct persons is so difficult It’s no wonder that preachers dread preaching on Trinity Sunday. 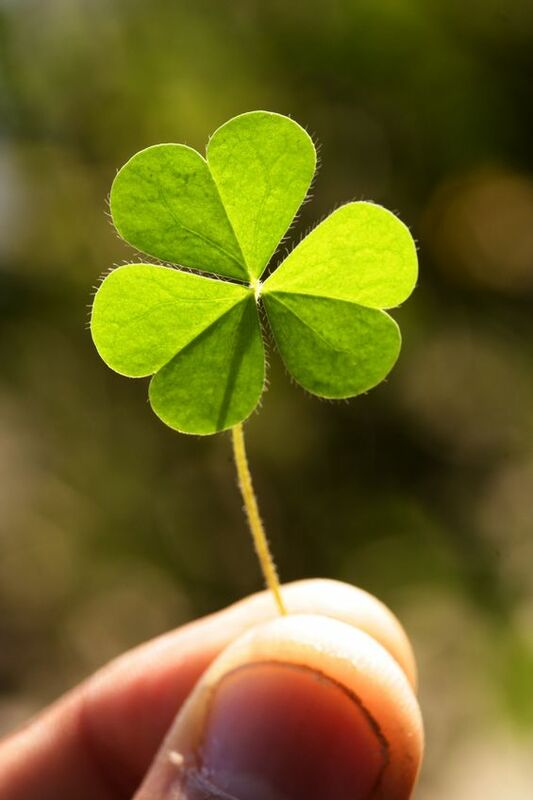 Saint Patrick famously used a three-leafed clover as an illustration. Well- if you go away today and remember just one thing remember this. In each of our three readings today we are told that God reaches out and embraces us, God wants to be with us – but that his presence with us is in response to our desire to be with him, to reach out to him, to live his ways and according to his commandments. It’s a two-way relationship. Isaiah says: Those who wait for the Lord shall renew their strength. Not everyone, but those who wait for the Lord. Paul says: Put things in order … agree with one another, live in peace; and the God of love and peace will be with you. Sort your lives out, get your community in order – and then God will be with you. And Jesus says, only after his instruction to baptize and to teach obedience to his commandments: I am with you always, to the end of the age. God the Son, the Beloved Redeemer, in whom we know of love, self-giving, forgiveness and eternal embrace. God the Holy Spirit, the Breath of Life through whom we are bestowed with gifts and peace, and gentleness. Holy Trinity, surround us with your dynamic love. One in Three and Three in One, teach us to be one. Unite us all in loving relationship, younng and old, that we may open to receive, ready to give, and at ease to serve. Amen.